I am really diggin the Art Philosophy bundle from Close to My Heart! I am not sure whether to thank Melanie or to choke her at this point because she is going to have me addicted to CTMH products! *okie thinks she will probably just say thank you and then buy Mel a drink on the next cruise*. I wasn't sure I liked the color of the flowers for the card when I got them all cut out but I wasn't going to waste paper and do them over. I did decide I liked them a little more after adding some embellishment to them. I did pop dot the large yellow flower. I cut the sentiment at the recommended size and then cut a base layer set at about 1/4" larger so i could have a shadow base. If you are wanting to order the Art Philosphy bundle you can contact Melanie at her CLOSE TO MY HEART WEBSITE. 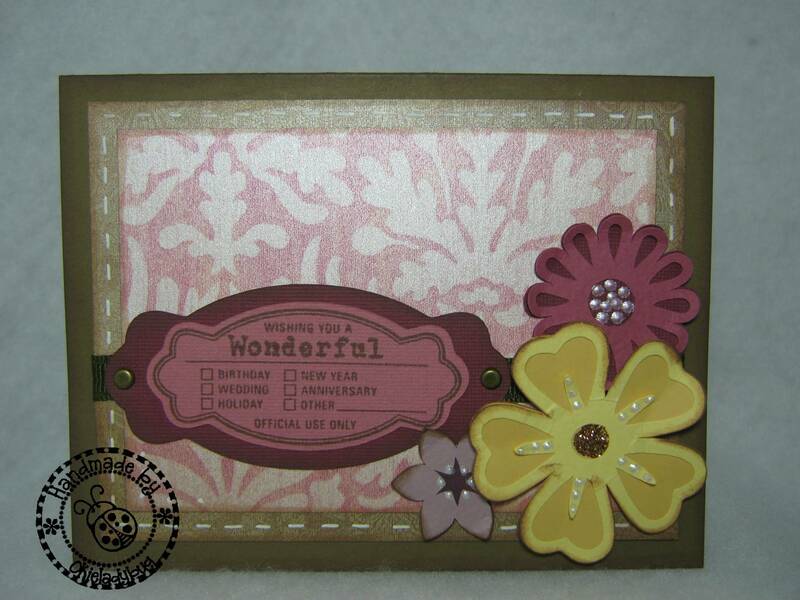 WOW okie, this card is wonderful and so very versatile! Congratulations on your designer spot. You don't have to worry, you're the funniest crafty gal I know. Your cards are witty and I absolutely love your rambling!!! Beautiful card. CTMH has some wonderful products. It will be a good addiction. But isn't having a child worth it??? Congrats on your new design job. Looking forward to more lovely creations from you. Very pretty! Love the flower colors. Thanks for the great card! Okie- forgot to say that I am glad you are feeling better. I know what you mean about those coughing fits. HeHeHe. What a beautiful card, love the colors. Glad you're feeling better! OMGosh Okie, I just love you so much!!! You remind me of my Oldest Sister that passed away in 2006 just 10 months before my sweetie. I loved her to pieces as I do my two younger Sisters. She wouldn't have thought anything about saying she was tired of peeing her pants!!!! I love this card, you could use it for lots of different occasions. Quit with this cartridge already, I can't afford it! ;-) That last sentence...yep. Great card. Glad to hear you're starting to feel better. Glad to hear you are feeling better! I'm with the group that says, "darn, I hate when that happens!"...LOL! 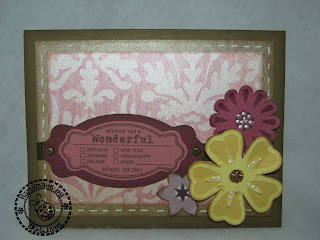 Your card is beautiful and I love the colors you chose! i love this card and that you used the art philosophy bundle. i just started useing this and if anyone hasn't invested in this set you're losing a great team in that you cut and stamp together. love it. This is a wonderful card Okie. Oh my this is so beautiful! 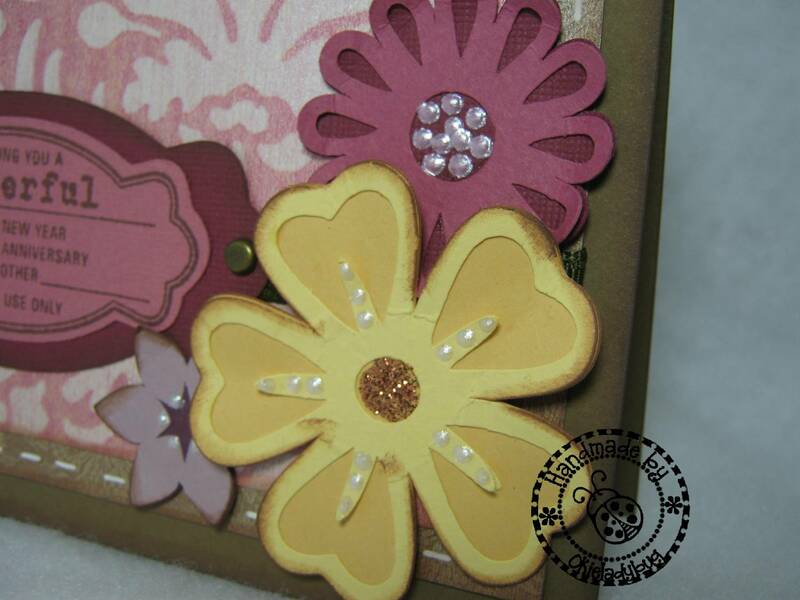 I like the colour of the flowers and the embellishments that you had put in this. Overall, the LO is fantastic!